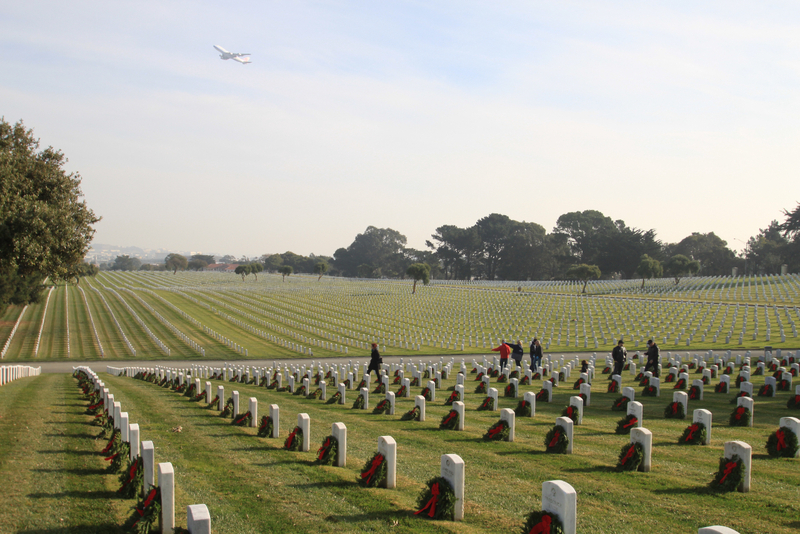 SAN BRUNO, CA - On a clear Sunday morning in December, at national cemeteries in all 50 states, a grateful nation paid homage to its fallen heroes by laying a Christmas wreath on their tombstone. 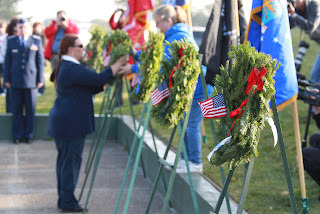 Various veterans groups, local residents, families and Civil Air Patrol Squadrons took part in the Wreaths Across America campaign whose mission is to Remember, Honor and Teach. Members of Amelia Earhart Senior Squadron 188, East Bay Cadet Squadron 18 and an estimated crowd of 200 gathered in the center of the Golden Gate National Cemetery in San Bruno California to hear local dignitaries, family members and veterans give thanks to those who have served and continue to serve in the armed forces. The ceremony began with a musical prelude by a lone bagpiper calling the gathering to order and setting the tone for the morning’s events. The flags of each branch of the armed services, merchant marines, and Blue Star Moms served as a back drop to the podium. There was a moment of silence, followed by the Presentation of Colors by cadets of Squadron 18. The Silicon Valley Chapter of the Sons of the American Revolution served as Honor Guard, and Chaplain Colonel Leo McArdle led the Pledge of Allegiance. Several people in attendance joined local resident Maria Quiarte in singing the National Anthem. This was followed by the Invocation, recognition of dignitaries and opening remarks. Representatives of the U.S. Army, U.S. Navy, U.S. Air Force, U.S. Marines, U.S. Coast Guard and Merchant Marines and Blue Star Moms were each presented with a wreath which they hung at the base of the flag representing their respective branch of service or organization. A Blue Star Mom and Navy veteran addressed the crowd and spoke of what it was like to send her only child off to war. With tears in her eyes, she shared her story of spending holidays alone, fearful she might not share another with her brave warrior. A three-volley rifle salute by cadet and senior members of Squadron 188, Squadron 18 and Group 2, followed by a soulful duet of Taps closed the ceremony. The group of spectators and participants moved towards section 2C of the cemetery where several hundred wreaths were waiting. 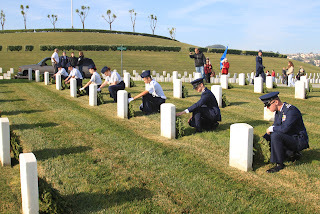 Colonel McArdle gently laid the first wreath against the tombstone of Admiral Chester Nimitz. Members of the crowd collected wreaths and respectfully walked among the tombstones and laid them against a tombstone and in their own way, gave thanks to a hero they likely never knew. • Pictures of the event are located here.